Certain business use cases require specific operations to run automatically on a regular basis. JustOn provides a number of options that facilitate process automation. JustOn ships a number of ready-to-use batch chains that cover certain business processes. Batch chains may require additional options. To this end, JustOn has introduced batch parameters, a type of custom settings that combine a batch chain with specific arguments. Consequently, you can use batch parameters to control the execution behavior of a batch chain. If your batch chain does not need additional parameters, you schedule the job directly for the batch chain. If, otherwise, the batch chain requires additional parameters, you schedule the job for the specific batch parameters setting. AssignBalancesChain Executes a balance assignment for all open invoices. DunningRunChain Executes a dunning run for all dunning levels and the corresponding overdue invoices. EmailJobChain Sends queued invoices and dunnings via email. ExportChain Exports invoices or booking details to CSV files. InvoiceRunChain Executes an invoice run. InvoiceStatisticsChain Updates invoice statistics for the Invoice Statistics extension. SubscriptionBuilderChain Executes the subscription builder. SubscriptionPriceIncreaseChain Executes a subscription price increase. SubscriptionRenewalChain Executes a subscription renewal. TransactionBuilderChain Executes the transaction builder. PaymentRunChain Executes a payment collection for all open invoices if there are payment instruments available for the corresponding account. Requires a Payment Provider Integration via the Self-Service Portal. VATValidationChain Executes the VAT validation. You can schedule a job using JustOn's Scheduled Jobs page. The Scheduled Jobs page is available as of JustOn 2.44. Batch Chain Job is a user-friendly label for the ScheduledBatchChain Apex class. In the Job Name field, specify the name of the batch chain or the name of the batch parameters setting. For details, see Scheduling Concepts. This sets up the job to execute the selected batch chain at the specified time. You can schedule a job using the standard Salesforce Schedule Apex functionality. For more details about Apex job scheduling, see Schedule Apex in the Salesforce Help. To schedule a batch chain, you can run the ScheduledBatchChain class in the Salesforce Developer Console, specifying the intended schedule. where name is the name of the batch chain or the batch parameters setting (see Scheduling Concepts) and schedule is a cron expression. You can schedule the invoice run to have invoices created automatically on a regular basis. The scheduled invoice run may require additional options. To this end, you can set up the invoice run to be executed with additional parameters. Interval x(d|w|m) Specifies the invoice run period, where x is an integer, d=day, w=week, m=month. Interval = 1m and Alignment = next means that the invoice run period is the next month. Interval = -3m (negative value) and Alignment = current means that the invoice run period is the current and the last two months. Interval = 1w and Alignment = previous means that the invoice run period is the previous week. If the calculated invoice run period and the specified filters belong to an existing invoice run, then JustOn uses the existing invoice run instead of creating a new one. This sets up the invoice run to be executed on a regular basis at the specified time. 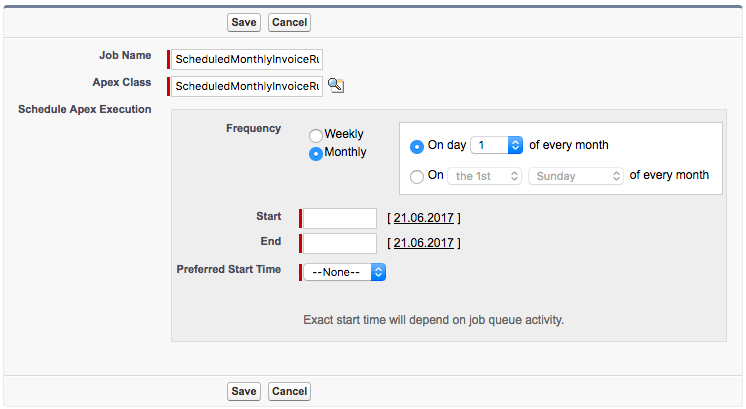 You can set up a job in order to have balances automatically assigned to open invoices on a regular basis. The balance assignment job does not require additional parameters. That is, you can set up the job directly for the corresponding batch chain AssignBalancesChain. For details, see Scheduling Concepts. To schedule the balance assignment batch chain, you can use either JustOn's Scheduled Jobs page or Salesforce's Schedule Apex functionality. For details, see Scheduling a Job. In the Job Name field, specify AssignBalancesChain. This sets up the balance assignment to be executed at the specified time. You can set up a job in order to have booking details generated from payment balances automatically on a regular basis. JustOn recommends to schedule the payment bookkeeping data job for daily execution. The payment bookkeeping data job must run at least once per week, otherwise it does not detect all new, changed or deleted balances. The detection of deleted balances is improved if they are still available in the recycle bin. If you delete balances on a regular basis, you must align the operations for creating payment bookkeeping data and emptying the recycle bin. For the payment bookkeeping data creation to work, the global setting Create Bookkeeping Data must be selected. The payment bookkeeping data creation supports the custom Account field ON_DebtorNo. The debtor number is used as the primary bookkeeping account number for a payment booking detail, see Assigning Bookkeeping Accounts. The payment bookkeeping data creation supports the custom Balance field ON_ProviderFee for calculating the payment provider fees based on your payment provider contract. If the field is not available or empty, JustOn uses the standard Provider Fee field, see Handling Provider Fees. The payment bookkeeping data creation job does not require additional parameters. That is, you can set up the job directly for the corresponding Apex class BatchBalanceExportJob. For details, see Scheduling Concepts. To schedule the payment bookkeeping data creation job, you can use either JustOn's Scheduled Jobs page or Salesforce's Schedule Apex functionality. For details, see Scheduling a Job. From the Apex Job drop-down list, select Export Balances Job. The Job Name field is automatically set to BatchBalanceExportJob. This sets up the payment bookkeeping data creation to be executed at the specified time. If you distribute electronic invoices via Basware, you can set up a job in order to retrieve notifications for the processed invoices from Basware on a regular basis. The Basware notifications job does not require additional parameters. 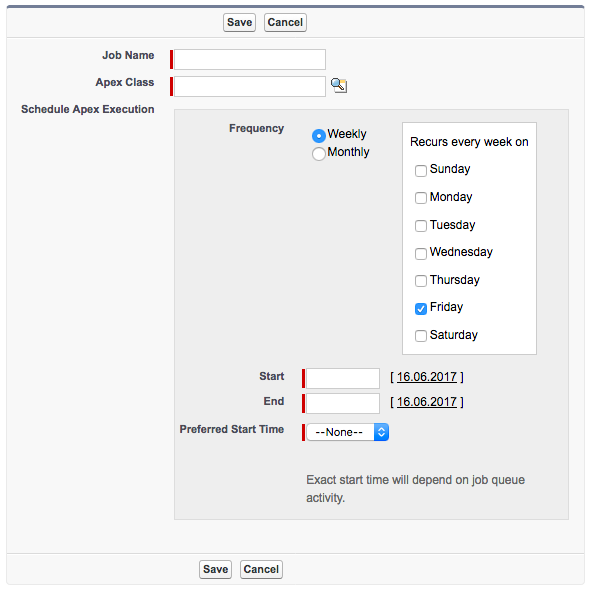 That is, you can set up the job directly for the corresponding Apex class ScheduledBaswareNotifications. For details, see Scheduling Concepts. To schedule the Basware notifications job, you can use either JustOn's Scheduled Jobs page or Salesforce's Schedule Apex functionality. For details, see Scheduling a Job. From the Apex Job drop-down list, select Basware Notifications Job. The Job Name field is automatically set to ScheduledBaswareNotifications. This sets up the Basware notification retrieval to be executed at the specified time. You can set up a payment run job in order to automatically collect payments for open invoices on a regular basis. The payment collection requires a payment provider integration with support for pre-authorized payment transactions, exposed as future payments. The payment collection is available as of JustOn 2.53. The payment run job does not require additional parameters. That is, you can set up the job directly for the corresponding batch chain PaymentRunChain. For details, see Scheduling Concepts. To schedule the payment run batch chain, you can use either JustOn's Scheduled Jobs page or Salesforce's Schedule Apex functionality. For details, see Scheduling a Job. In the Job Name field, specify PaymentRunChain. This sets up the payment run to be executed at the specified time. If you use subscription metrics for MRR reporting, you must schedule the subscription metric builder job to create or update subscription metric records. You can set up a job in order to have VAT numbers validated automatically on a regular basis. To schedule the VAT validation, you can use either JustOn's Scheduled Jobs page, Salesforce's Schedule Apex functionality or the Force.com Developer Console. For details, see Scheduling a Job. From the Apex Job drop-down list, select VAT Validation Job. The Job Name field is automatically set to BatchVATValidationJob. This sets up the VAT validation to be executed at the specified time. For accounts to be considered by the job, the VAT number source field (VATIN or ON_VATNumber) must not be empty.